Urbanscapers, consider yourselves warned. Malaysia’s creative arts festival celebrates 12 years of Urbanscapes with a month of activities which included satellite shows featuring Scottish post-rock band Mogwai (Nov 30) and American comedy rock duo Tenacious D (Dec 1) before the full-fledged festival on Saturday at the Horse Ranch, Resorts World Genting. At the country’s longest-running creative arts festival, guests have the opportunity to explore creative arts, culinary and cultural offerings while enjoying a thrilling line-up of local, regional and international bands. Come Saturday, festival goers can look forward to the rousing sounds of the Los Angeles-based indie rock band, Local Natives. Playing alongside it will be the legendary American college rock outfit, The Lemonheads whose cover of Simon & Garfunkel’s “Mrs Robinson” provided them with the much-needed breakthrough in their salad days. Grammy Award-winner Kimbra, the New Zealand-born single-named art-pop songwriter and Jagwar Ma, the Sydney-based psychedelic/dance band will be performing at Urbanscapes. Fans of our own local artistes can look forward to OJ Law and his versatile range of catchy melodies intertwined with infectious guitar beats and unforgettable vocals. Singer-songwriter Ali Aiman will serenade festival goers and the talented singer Najwa will give fans the opportunity to experience sounds from her new EP that features darker undertones with sombre, minimalistic echoes. The other acts that complete the festival line-up are June Marieezy, Faiq and the Manja Mob, Azmyl Yunor & Orkes Padu, The Cotton Field Scarecrowes,Cashew Chemists, Paperplane Pursuit, Jumero and Dirgahayu. Known for its off-beat festival sites, Urbanscapes is the first to introduce a highland festival experience to the expanding Malaysian festival circuit. Since its inception, it has supported Malaysian grassroots movements, fuelled home-grown entrepreneurs and provided a platform that has launched the careers of many artistes. Festival goers can expect local brand offerings from clothes to sports attire to high-quality, distinctive canvas art. Among the brands that will make an appearance at the festival are Ash Be Nimble, Mosaic Bijoux, Psychedelic Store, Nyo, Trendy Bellaz, I’ll Studio, Third Culture, URBN8, CanvasPick, Prototype gallery, Huggaz, Homu store, Robe Du Jour, Wild Baby, Sun Off A Beach just to some. 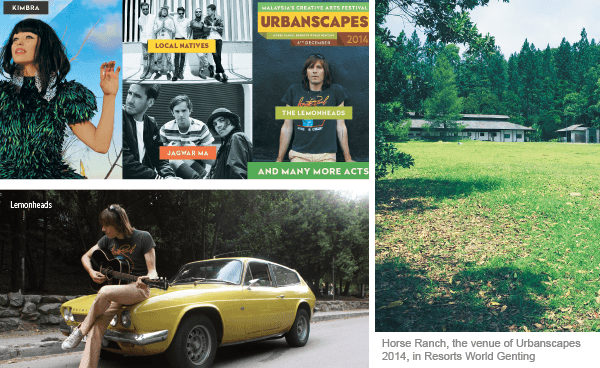 Urbanscapes is transforming the assumption that stables are just for horses. Wandering through the festival grounds will take the crowd to “The Democratic People’s Republic of North Bangsar”, a mock parody country with a back story that is hilarious — and perhaps, plausible. Produced by Terry & The Cuz and Kuah Jenhan, “North Bangsar” offers an experience much like walking into a film set. Visitors to the festival will get to meet its mayor — Jenhan — and explore the town, get a “prescription” from a Chinese medicine hall and participate in the “local” activity of choice. Or you could explore the sounds, shapes and power of water with The Biji-Biji Initiative’s interactive water tower. This tower will also light up in the night — turning it also into an art installation. For more information, check out urbanscapes.com.my and to buy your Urbanscapes tickets, visit www.ticketpro.com.my. Tickets can also be bought at physical outlets throughout the country. For the full list, look them up at www.ticketpro.com.my/jnp/ticket-outlets/index.html. This article first appeared in The Edge Financial Daily, on December 3, 2014.